A sentence is incorrect if it contains a double subject—a subject with a pronoun right after it. To fix a double subject, delete the pronoun and use the subject only. Or delete the subject and use the pronoun only. 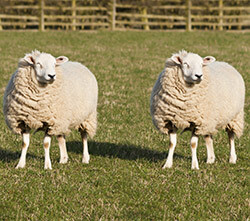 ✔ The sheep look identical. ✔ Mark gave a great classroom presentation. ✔ He gave a great classroom presentation. ✔ It is closed today. Your Turn Edit the following sentences to remove the double subjects. Phil he plays trumpet in the school jazz band. The movie it is awesome. Mrs. Anderson she teaches third grade in Illinois. Josie her favorite sport is soccer. My friend he has a huge collection of sea shells. The weather it is turning stormy. If you want to know why I called, my homework it is still at school. The assignment it is due tomorrow. If you don't have the worksheet, Jennie she will give me one. Those sheep they really look like clones. Avoiding Double Subjects by Thoughtful Learning is licensed under a Creative Commons Attribution-NonCommercial-ShareAlike 4.0 International License. Based on a work at k12.thoughtfullearning.com/minilesson/avoiding-double-subjects.